PEC was selected as the Civil Engineer on the design team working on the new football practice fields. PEC also provided full topographic and utility surveys for the project. 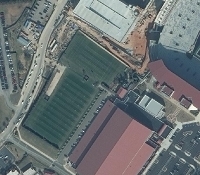 Construction of the parking garage (another PEC project) reduced the size of the existing practice fields. The new design will reconfigure and expand the fields to provide adequate practice space for the Ole Miss Rebel football team.